NordicTrack Elite 9500 PRO treadmill is a top-of-the-line fitness solution that offers the best that NordicTrack has in its formidable fitness arsenal. This exceptional treadmill provides one feature after another with the singular purpose of ensuring that you achieve your fitness goals successfully. 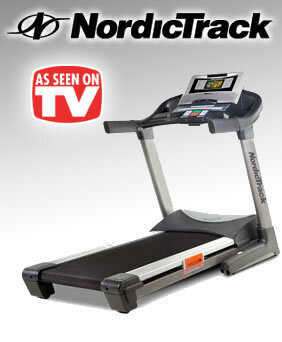 Welcome to the ultimate treadmill experience, the NordicTrack Elite 9500 PRO. Built for the gym, this treadmill features everything from a powerful 4.0 CHP commercial-grade motor to a spacious 20″ x 60″ treadbelt. Dedicated Solaris LED displays quickly track your workout stats so you can concentrate on the finish line and a built-in 7″ TV will help you stay up on the news or your favorite TV shows. The Elite 9500 PRO is designed for your home. It’s designed for your success. Equipped with DuraStride Adjustable Cushioning, you can quickly customize your deck cushioning for the perfect fit. It reduces impact on your ankles, knees and spine by 15-33%, depending up which setting you prefer. The console on this powerful treadmill features iFit Workout Card Technology, a Compatible Music Port for iPod and Intermix Acoustics 5.5 with high-end speaker and subwoofer components. And, the Elite 9500 PRO comes with a Lifetime Motor Warranty and a Lifetime Frame Warranty so you can stride in safety and run with peace of mind. DuraStride Adjustable Cushioning: We are all unique…we all have different bodies and different goals, and we’ve all run different paths. Now, with DuraStride Adjustable Cushioning, your deck cushioning can be just as unique. The product of years of university-partnered testing and research, DuraStride Adjustable Cushioning reduces impact on your ankles, knees and spine by 15-33%. Plus, unlike most one-size-fit-all treadmill cushions, DuraStride employs a moveable isolator, which allows you to change your support from a firmer, street-like workout, to a softer, joint-friendly workout, or anywhere in between. This is cushioning for everybody and every body, this is DuraStride Adjustable Cushioning. EKG Grip Pulse: Make the most out of every workout by monitoring your heart rate with these sensors that are built into the handlebars, ensuring you’re always in the right training zone for your goals. SpaceSaver with AirLight Lift Assist Shock: This patented, revolutionary design allows your treadmill to fold vertically for storage. To make it even easier, this treadmill includes a powerful shock that helps do the lifting for you with an easy push. iFit Workout Card Technology: Lose weight, feel great and improve performance in just 8 weeks with the interactive iFit Workout Card Technology! Each card is designed by a Certified Personal Trainer and plugs directly into the treadmill’s console, automatically adjusting your speed and incline while the voice of a personal trainer takes you through each workout. iFit Workout Cards are available in Weight Loss, Wellness, Circuit Training and Performance categories to give you the most advanced, interactive and result-specific fitness options. Dedicated Solaris LED Displays: Focus-it’s what makes the difference between being a mere participant and becoming a champion. And, it’s what makes Solaris LED Control Panels truly exceptional. Like display technology available in luxury cars and commercial appliances, Solaris reduces visual clutter, creating clean, stylish display screens. And, by employing specialized LEDs, Solaris displays are tuned to the perfect brightness, making them easy to read. Solaris Control Panels also feature ergonomically positioned controls, streamlined navigation and intuitive software. It’s the quickest, easiest, most effortless workout control possible. 24 Performance Workouts: Get ready for the ultimate performance training. These workouts are designed by Certified Personal Trainers and will help you run faster and stay in shape longer. 4 Distance Workouts: These Distance Workouts are designed to help you train for specific racing or running events. Choose from 4 training programs and you’ll be on your way to reach your goals. 4 Heart Rate Workouts: Heart Rate Workouts help you stay in your target heart rate zone—increasing your speed and incline when you need to raise your heart rate and vice versa. 4 Create & Save Workouts: Customize your own workout with these easy-to-use Create & Save Workouts. You pick your goal, speed, incline and time length for the ultimate, personalized workout. Intermix Acoustics 5.5: Discover the ultimate listening experience with Intermix Acoustics. Integrated into the treadmill’s console, this premium sound system combines high-end speaker and subwoofer components to give you the best in crystal-clear sound quality. 7" Flat-Screen TV with Digital Tuner: Technology that was once only available for top-of-the-line commercial machines, this cable-ready, interactive TV is built right into the treadmill console. You can stay up on your favorite shows while staying in shape. Warranty: Lifetime Frame Warranty, Lifetime Motor Warranty, 2-Year Parts and 1-Year Labor. The NordicTrack Elite 9500 PRO treadmill is a top-quality exercise solution that’s designed to ensure that you get a superior workout every time that you use it. The Elite 9500 PRO treadmill from NordicTrack will get you started toward meeting your fitness goals and burning off those extra pounds in no time. I was looking for a treadmill with all of the bells and whistles so to speak and this one really fit the bill. I've had it for 3 months and it runs like a champ (no pun intended). I was afraid that the TV might be too small to be useful but I was happy to be proven wrong. While I certainly wouldn't mind a larger screen it really works well for its purpose.